Valuations across the mining industry are coming down as a result of low commodity prices and uncertainty about the future of the global economy. Many companies are reviewing investment plans, pressured by investors to return money to shareholders if the project pipeline is short of feasible investment opportunities. Most companies in the industry will be extremely careful with large-scale M&A at this moment, but for some companies with either a lot of cash or a good position to give out more equity the reduced prices could provide opportunities to make a big acquisition. The ranking presented below presents the attractiveness of acquiring any of the Top 40 mining companies. An acquisition of any of the world’s largest 40 miners will have to be financed to a large extent by raising additional capital from equity holders, as the acquisition price would be too high for most companies to pay cash after taking on more debt. The attractiveness of executing a share deal to acquire a company is split into the current level of share depression (historic performance) and the outlook for the share as given in analyst targets (future performance). The share depression is represented in the chart and the ranking below by taking the ratio of current share price compared to 52-week high, normalized to the performance of BHP Billiton, the largest company in the group (i.e. share depression of BHP Billiton = 1.0). The 52-week high is used surprisingly often in acquisitions as the price paid, as it is easy to accept for many shareholders of the target company that they will receive the highest price over the past year. The outlook for shares is given by the ratio of consensus analyst target dividend by current share price. Whatever the historic performance of a share, the outlook ratio shows the expected potential for the share. For these large mining companies the consensus target is typically formed out of at least 10 equity analyst and banker targets. An overall ranking score of share attractiveness is calculated by dividing the outlook ratio by the share depression ratio. In this initial ranking of attractive targets, using closing share price of August 3rd 2012, the top 5 positions are claimed by ENRC, Ivanhoe, Kinross, Peabody, and Anglo American. Each of these shares has taking a significant beating over the past year. Apart from Anglo they have all dropped about twice as far from their year high share price as BHP Billiton. However, analyst targets for each of the companies are high too, each being expected to gain at least 50% of value in the relatively short term. The combination of a big drop in share price and a promising upside makes the companies attractive for potential buyers. Clearly many more factors play a role in target selection, and politics, synergy potential, and several other factors rule out quick action for most of the top targets in the ranking. However, the chart and ranking below do serve well as a quick scan to see which companies are in the ‘danger zone’ of becoming an acquisition target. “Commodities trader Glencore (LSE:GLEN.L – News) is not considering a bid for embattled miner ENRC, its chief executive said, dismissing reports of a takeover after it disappointed the market with its maiden first-quarter results. Shares in the world’s largest diversified commodity trader dropped 2 percent as weaker-than-expected results from its metals and mining trading unit held back its operating profit. Kazakh miner ENRC, with a free float of less than 20 percent, has long been seen as a potential target for Glencore. Industry sources say Glencore could be tempted by its undervalued assets and a heavy fall in the shares as a result of a boardroom spat over its leadership that has seen the departure of two independent directors. Following a review of ENRC’s governance structure various independent directors and the general counsel have either left or have not been reelected by the majority shareholders. The leaving directors claim that the company is run authocratically and the owners are not willing to open up control. Glencore was rumoured to be interested in launching a takeover for ENRC, which suffers from a depressed shareprice. However, Mr. Glasenberg (Glencore CEO) said the company wasn’t holding any discussions to purchase ENRC when announcing Glencores 1st quarter results. A potential acquisition of ENRC by Glencore would only have chance of success if the founders are willing to sell their shares. The Kazakh government is unlikely to sell its stake in the company and the total share of ownership of the 18% free-float and the Kazakhmys share would not enable Glencore to excercise control. Many analysts are trying to figure out which large mining company will be Glencore’s major acquisition target. As long as not further equity is raised the company will be able to make an acquisition up to a value of some $30-40bln. The target should mainly be complementary to Xstrata’s global operations, as it is likely that management of the owned and controlled operations is centralized in the coming years. “Private feuding within Eurasian Natural Resources Corporation, the Kazakh miner, spilled out into the open on Wednesday as investors in the tightly held company overwhelmingly voted against the re-election of Sir Richard Sykes, the senior independent director, and fellow board member Ken Olisa. The public dismissal of the two directors highlights the deepening tensions within the FTSE 100 miner. It has been dogged by corporate governance concerns since it floated in 2007. Speculation about boardroom battles has intensified since the group announced controversial acquisitions in central Africa last year, most notably the purchase of mining assets in the Democratic Republic of Congo that the Congo government had recently expropriated from a Canadian mining company. ENRC was formed in 2006 by consolidation of assets privatized in the mid ’90s. The founders are Alexander Mashkevitch, Alijan Ibragimov, and Patokh Chodiev; each still holding 14.6% of the shares, with the Kazakh government holding 11.7% and Kazakhmys 26%. Because Kazakmys abstained from voting the founders and government held at least 75% of the voting shares. Current CEO Felix Vulis announced his departure in February, and the founders are rumored to want to replace several other executives and board members. The dismissal of the directors has tipped the weight of the board to the founder’s side, giving them significant power. Unless the dismissal of the independent directors came as a surprise to the persons in question the fact that they did not make a quiet move out of the board should be understood as a means to draw the attention to the governance issues of the miner. It appears that the founders and the Kazakh government want to strengthen their control over the company, even though it has mainly been expanding internationally in the past years. The debates in the board about the acquisition of the projects in Congo including the Kolwezi asset, formerly owned by First Quantum, indicates a cultural difference between the Kazakh hardliners and the more western independent directors with more eye for corporate social responsibility. With various other Eastern companies listing on western stock markets this will be an issue that will surface more often in the future as many development projects are undertaken in politically unstable areas. “Anger is growing among London’s investor community over the decision by a FTSE 100 miner to buy a disputed copper project in the Democratic Republic of Congo. Eurasian Natural Resources Corp, the London-listed Kazakh miner, last week bought a majority stake in a collection of Congo mining assets that includes the controversial Kolwezi project. ENRC paid $175mln for a controlling stake of the asset that has been partly developed by Quantum Minerals. The government of Congo seized the asset after Quantum invested $700mln. The company and the government disagreed on the rights given to the company for prospecting and/or mineral extraction. ENRC is strongly integrating vertically, buying mining assets around the world. 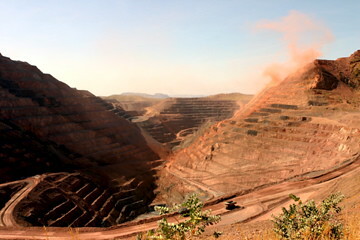 The potential IPO of Zamin would make the ENRC benefit from the capital this would free up to develop the Bamin iron ore deposit in Brazil, one of the most important projects. Though the Kolwezi asset is a financially attractive asset many miners refrained from bidding as the government’s action against Quantum was regarded to violate the business code. Many miners will have been afraid of similar future action of the government in case they would buy the asset. This year the government of Guinea decided to take part of the rights to the Simandou deposit away from Rio Tinto, saying the company did not honor the investment agreements made earlier. Redistribution of these rights have not yet led to a reaction in the mining industry that would hurt the reputation of a future owner of the rights.